What I enjoy the most about Pinterest is the inspiring photos I find. I love dreaming about finding the perfect home. A wonderful touch that will make a home more cozy and dreamy. 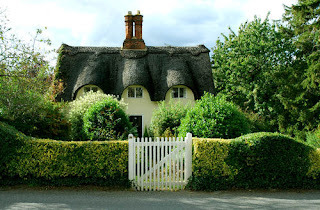 This cottage for instance. I can see myself living there with my family for sure. The words cozy, relaxing, calming come to mind when I see this photo. What images help you to daydream? That is a beautiful picture , such a pretty cottage you can imagine sitting there in the peace, with a good book, a cup of tea and the kids in the garden. My daydream pictures would be dramatic landscapes .